Today was such a perfect day. It is my only day off this week, but that is ok with me because it was really the best day we've had in a while. Ollie and I went shopping downtown, then ate some sushi and watched the new Men in Black in 3D. It was actually really good! After the movie, we went down to the water to catch the last bit of sun and take some photos. I love that days are lasting so much longer now. You can really fit so much more into one day! What a beautiful athmosphere! I understand that you love the dress! You're cool and stylish...always!! beautiful sunset pictures!!! the pictures are perfect!!! love them!! and love the dress and how you combined this outfit!!! love the pics taken at the going down of the sun! love this kind of dress, you look beautiful! love the maxi. the perfect laid-back look! Omg I'm still working on my shopping outfit! I totally know what you mean. Lovely photos btw, the sunlight is beautiful. This is such a pretty dress, Alison! I love how it can be casual or dressed up! you look so STUNNING... I am now following. I hope you can check out my site: http://theproverbs.net and FOLLOW. Hope to hear from you soon. Thanks for your time! 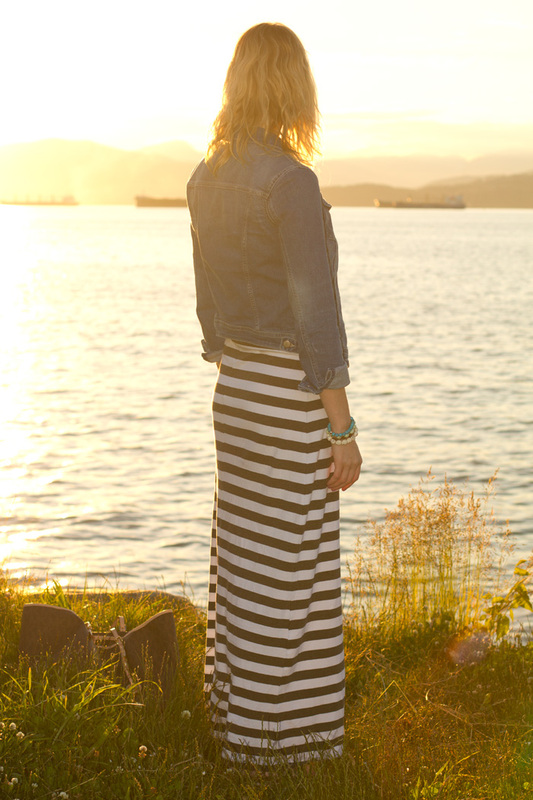 Love this super simple maxi! La robe est tres chouette!! !J'aime beaucoup! So beautiful pictures! The light is perfect!!! Nice pics! love your dress! I absolutely love this type of outfit, with a simple dress and amazing landscape and pictures!